Nespresso is constantly evolving the way you drink espresso and coffee. Offering freshly brewed coffee with crema as well as delicious, authentic Espresso. Four freshly brewed options thanks to revolutionary Centrifusion and barcode reading technologies: 1.35 oz espresso, 5 oz Gran Lungo, 8 oz coffee, and 14 oz Alto at the touch of a button. It uses two different capsule sizes: large capsule for coffee and a small one for espresso. Vertuo coffee makers deliver a perfect cup of coffee time after time, thanks to Centrifusion. Vertuo uses an intelligent extraction system that recognizes each Grand Cru blend. Thanks to a barcode on the rim of the capsule, the brewing parameters are adjusted by the machine, with no need to change settings. This delivers the best in-cup result for your chosen variety - at the touch of a single button. The capsule is automatically ejected after brewing, with only 15-20 seconds of pre-heating time, while the automatic energy-saving function switches the machine off after 9 minutes of inactivity, consuming less energy. Each machine includes a complimentary welcome set with a range of Nespresso Vertuo capsules with unique aroma profiles. COFFEE AND ESPRESSO MAKER: Create exceptional barista grade freshly brewed single serve coffee or espresso cups at the touch of a single button; Designed for use with Nespresso Vertuo capsules only. 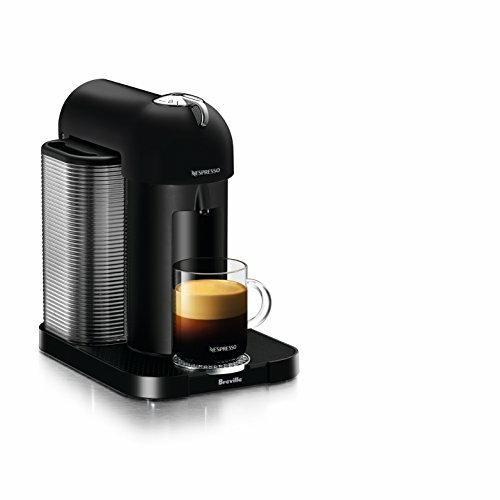 SMART COFFEE MAKER: Brew a perfect single serve coffee or espresso cup time after time, thanks to Nespresso's CentrifusionTM technology using barcode reading to deliver the optimal in-cup results for each blend including the perfect crema for larger coffee cup sizes. AUTOMATIC COFFEE/ESPRESSO MAKER: Brew different single serve coffee cup sizes at the touch of a button depending on your coffee needs - espresso (1.35 oz. ), double espresso (2.7 oz. ), gran lungo (5 oz. ), coffe (7.7 oz.) and alto (14 oz. ).